Is your business targeting the Asian region and is contemplating whether it’s worthwhile to localize your software product, website, marketing content, or corporate text for the Thai market? To better answer if the case for localizing Thai language is justified from a financial and possible Return on Investment (ROI) standpoint; let’s look at the overall financial growth and consumer market in Thailand; the current investment climate in Thailand, the Thai economy and the Thai consumer purchasing power (GDP). Thailand’s economy has experienced a strong financial growth of between 7 – 8 % on average per year and the country has transformed its economy over the past decades from being originally an economy with its roots based in the agriculture sector, to evolve into light- and domestic industries, followed by an age of more complex industries with much foreign direct investment (FDI) which saw Thailand turn into a manufacturing hub in Asia for many foreign companies. In 2017 Thailand has seen improved consumer sentiment with robust performance in external sectors with exports and trade partners and strengthening domestic demands. Comparing to other AEC members, Thailand enjoys many advantages such as being less prone to natural disasters; it has a big pool of skilled qualified workers and Thailand’s baht currency (THB) is accepted in border trade transactions within ASEAN. Since the inception of the sitting Government lead by the Prime Minister Prayut Chan-ocha’s (ประยุทธ์ จันทร์โอชา) it’s been widely recognized that there has been an improvement in Government efficiency which has been recognized by the IMD Institute for Management Development for being the key reason why Thailand climbed two spots the World Competitiveness Ranking for 2016. The independent Institute assessed the contributing factors behind Thailand’s growth and investment readiness as ‘ready for business’ climate, positive attitudes, capable and skilled workforce, reliable infrastructure, a dynamic economy and business competitiveness. The optimistic forecast and outlook for the country is contributed to a strengthened internal market by an expanding middle class as well as the increased value of competitiveness created by value-driven exports. The Thai economy is highly interdependent on trade and foreign investment and the expansion of Thailand’s economy has always depended on foreign investment in Thailand (FDI). Thailand is better prepared to capitalize on its experience in trade and forming strategic alliances to attract foreign investors than its neighbouring AEC countries which give Thailand opportunities over other AEC members to continue to attract investment outside of the region. Thailand due to its association with the global economy has a large surplus of US 1.36 billion, ranked second after Singapore, and was the only country of three with a trade surplus to ASEAN which suggests Thailand will reap significant benefits from the AEC especially in terms of expanding exports to ASEAN. The size of Thailand’s domestic market, geographical area, and the country’s economy is the second largest in ASEAN just after Indonesia; the purchasing power of Thai consumers remains higher than their neighbouring countries. The average Thai consumer is not well versed in the English language and oftentimes not very familiar with the neighbouring countries and therefore prefers to read material where there is a Thai version available. The Thai education system does not go to the extent to facilitate study options on the languages, cultures, and economies of neighbouring countries. This means the case for translation is indeed justified and it makes sense to localize for Thailand for business to business or localize content associated with your products and services for business to customer. VEQTA has undertaken projects in fields such as consumer goods, and services, corporate texts such as legal documents, engineering blueprints, material for heavy industries or oil and gas such as Safety Data Material sheets (SDS) and texts for business intended for Thai affiliates. By translating into Thai it also shows you are serious about doing business with the Thai market in mind, consumer satisfaction and Thai culture – and not only come looking for money. If you need a high-quality language conversion VEQTA’s translation team in Thailand can assist, please contact our Thai sales representative. With the launch of the Governments initiative ‘Thailand 4.0’ under Prime Minister Prayut Chan-o-cha, Thailand is embarking on a 20-year National Strategic plan to enter a new era of growth by improving Thailand’s connection to the world markets. The direction of focus will be on a value-based and an innovation-driven economy which puts an emphasis on promoting technology, creativity, and innovation in 5 existing and 5 new specific industries. Firstly, the upgrading of five existing industries (Agriculture and Food, Tourism, Automotive, Electrical & Electronics, and Petrochemicals). Secondly, further development of five new industries (Automation & Robotics for the industry, Aerospace, Smart Electronics/Digital, Bio-Energy and Biochemicals and medical services / Healthcare with affluent medical and wellness tourism). Massive investments in infrastructure are in progress such as an expansion of the railway system with high-speed rail and airport upgrades and the Eastern Economic Corridor (EEC) which is the Government’s flagship initiative that is widely anticipated to play a major role in further boosting the Thai economy. 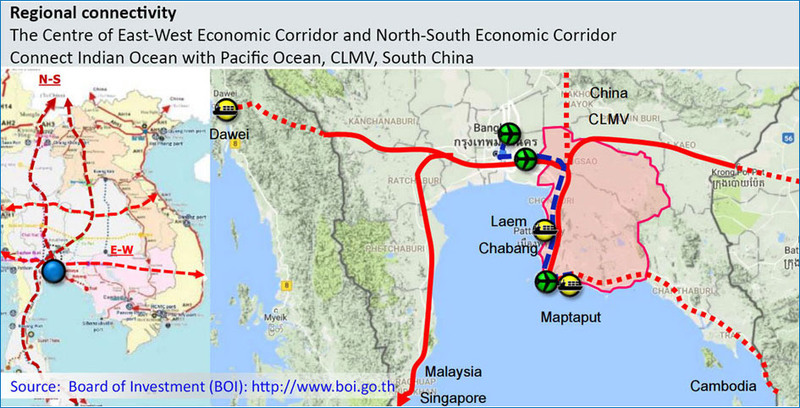 The EEC project will develop new growth hubs and boost existing ones and offer better regional connectivity in an area which spans over 13,000 square kilometres from Rayon, Chonburi, and Chachoengsao provinces as shown on the map below. Source: BOI Board of investment according to the Board of Investment (BOI), which is the department responsible for supporting and promoting investments, the value of new investments amounts to THB 144 billion (USD 4.05 billion) up to August 2016 with the 10 targeted aforementioned industries under Thailand 4.0, accounting for 48% of total investment. Foreign Direct Investments (FDI) in Thailand is expected to further increase slightly between 2017 and 2018. Thailand is currently regarded as one of the easiest and most favoured locations in ASEAN to carry out business and the case for localizing for Thailand remains strong. These initiatives by the Government aim to continue to nurture an environment that is conducive to investment based on a service-based economy, and one that will ensure a growing economy in the future. The investment in the digital economy, its so-called ‘supercluster policy’, the double-S curve, support to small to medium enterprises (SME), with these massive investments in infrastructure and transportation with the Eastern Economic Corridor promises to reinforce Thailand as one of the most preferred investment choices in ASEAN. Source: BOI Board of InvestmentThe Board of Investment (BOI) in Thailand is a great source of information to find out more about the initiatives taking place as it continues to demonstrate the government’s agenda for reform of the economy and readiness as an investment hub for both Thai and foreign investors in its transitions to Thailand 4.0. It’s message to businesses targeting the Thai market and for foreign investors is clear “Thailand is Open for Business! VEQTA Translations has gained an excellent reputation for providing translation to corporate clients both in South East Asia and clients worldwide. We proudly collaborate with clients such as Samsung, Fujitsu, Thomson Reuters and Toshiba to mention some of our esteemed clients. Our service-minded translators come from all walks of life and are specialized within their field of translation. Each industry field warrants a translator who is familiar with the industry terminology, jargon, and technical terms used pertaining to that field. We currently have around 400 Thai skilled linguists working for us on location in Bangkok and Thailand. All Thai linguists have formal academic qualifications such as a Bachelor Degree or higher. They also have work experience within their field of translation such as having worked in the legal field, pharmaceutical, medicine, I.T/SAP/ERP or the Safety Industry. This experience enables them to draw on that experience in the translation work and deliver superb translation. The process of assigning both a translator and a separate reviewer/editor on each project allows us to deliver quality second to none which is why our clients trust us for their translation and localization needs.